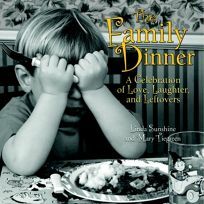 An ode to the joys of meatloaf and Campbell's soup, Sunshine and Tiegreen's compact book reveres that American family ritual: the family dinner. The authors--longtime friends and collaborators on books about shoes, dogs and other subjects--give the book a decidedly 1950s feel to play up the nostalgia for a time when Mom whipped up a hearty meal while Dad poured himself a cocktail and loosened his tie to dig in. Slightly idealistic (""family dinners establish the rhythm of family life and define who we are, where we come from, and where we might expect to be going""), the authors root their book in vintage photos and concepts. There's a photograph of a big Italian family--men in sleeveless undershirts and women with their hair done up--seated at a table replete with carafes of red wine; and another of a perky housewife, beaming as she takes a bottle of milk out of the fridge. Mini-essays and quotes from Calvin Trillin, Nora Ephron, Ruth Reichl and others complement the black and white photos. While corny at times, Sunshine and Tiegreen's homage is also wistful and oddly reassuring.